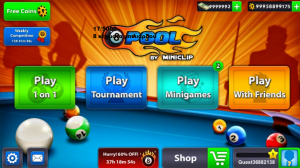 Hello friends here i tell about game: 8 Ball Pool is the pool game for IOS,Android and windows that you can play against people from any device in all over the world through connect to Internet in turn based games to check who is the best. 8 ball pool new update releases soon. 8 ball pool game is very similar to all type of pool game as game play. You can use your finger to target(aim) the cue, and change it forward to hit that ball in the any direction in which direction you want to hit. In this you need to try win from your opponent by following the rules set from the first pocket – shooting the striped or solid balls. Hello Friends Now here we discuss about the new update of 8 Ball Pool. 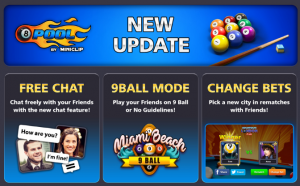 The 8 Ball Pool added some new features like: Free Chat to anyone ,9 Ball Tournament & More. There is a good news for all of you – The new version of 8 ball pool will be live soon. The new version of 8 Ball Pool will have the fantastic new features which are user want in this game. If you want to know more please keep reading……..
Chat and duel your friends – Now in 9 Ball too! In 8 Ball Pool game most of people asking for the live chat feature. Finally users can get that in this new update. Now the users can chat with their friends in the game and share their thoughts. The most of this , users can be able to challenge their friends in 9 Ball as well. There are no guidelines for dual your friends in using the bunch of new modes which are added in this game. In this new update you can do rematch with any one in game or with your friend with choose a new table for that match. 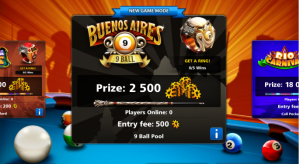 In the new update 8ball pool add new four tables around the world from Asia to South America. There will be also added new tournaments and Tiers with great challenges. Buenos Aires Ballroom – This will the first 9 Ball tournament ever! Beijing No Guidelines Paradise – A new table with, well, No Guidelines rules! Dallas Rodeo 9 Ball – This 9 Ball table has a Call Pocket on All Shots ruleset. 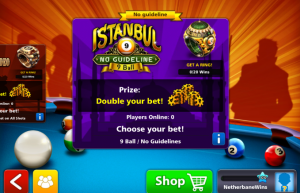 Istanbul No Guideline 9 Ball – The name says it all: 9 Ball mode with No Guidelines. A new update – Ready to travel the world? The 8 Ball Pool New update comes with the bunch of new tables, the most of one is 9 Ball Tournament and most wanted feature the free chat. It will be online soon in may/june. So be ready for the new update with new features to get amazing Buenos Aires ring . And also for challenge your friends to 9 Ball.